WASHINGTON — Orbital ATK announced March 13 it is developing a new version of a satellite life extension vehicle intended to provide more flexibility to customers while also moving the company closer to more advanced in-space servicing. Under the new approach, a Mission Robotic Vehicle, based on the MEV design, will carry 10 to 12 Mission Extension Pods. The Mission Robotic Vehicle would approach a customer’s satellite and use a robotic arm to attach a pod to that satellite. The pod would then take over stationkeeping, proving up to five years of additional life. The Mission Robotic Vehicle and Mission Extension Pods are intended to provide new solutions to customers that don’t need the full-fledged capabilities of the MEV. The pods have a shorter lifetime than an MEV and do not provide attitude control capabilities. The new system, designed to be ready for service in 2021, largely incorporates existing technology. The Mission Robotic Vehicle is a version of the MEV and the Mission Extension Pods is based on Orbital ATK’s ESPASat small satellite bus. One new technology will be the robotic arm. Tom Wilson, president of SpaceLogistics, the Orbital ATK subsidiary offering the satellite life extension program, said the company was considering technology from NASA as well as Europe. “We’ve got a couple of different options,” he said, but hasn’t yet made a decision on the specific technology. The robotic arm and pod technologies open the door to do more sophisticated servicing in the future. Wilson said that pods could carry other technologies, such as alternative communications payloads, to be installed on host satellites, while the arm could use tools to perform basic repairs. 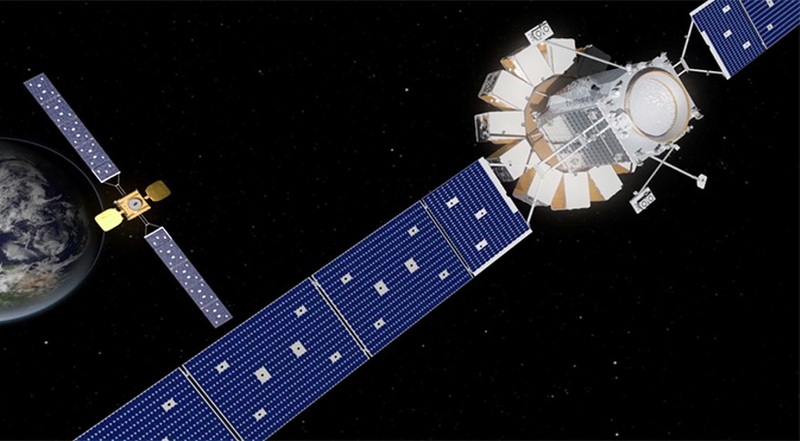 Orbital ATK announced the new satellite servicing approach during a time where there is growing interest in satellite life extension, as well as growing competition. Effective Space Solutions is developing its Space Drone spacecraft that will provide similar life-extension capabilities, while Space Systems Loral (SSL) is working on the Robotic Servicing of Geosynchronous Satellites program with the Defense Advanced Research Projects Agency, developing a vehicle capable of refueling and repairing GEO spacecraft. Satellite operators, once wary of such services, are becoming more interested in ways to extend the lives of their satellites. “I think the time really now has come for in-orbit servicing due to the confluence of several important factors,” said David Thompson, president and chief executive of Orbital ATK. Satellite operators are increasingly “capital limited,” he said, a situation exacerbated by uncertainties created by new technologies like high-throughput satellites and non-geostationary orbit satellite constellations. “The opportunity to continue to support their customers and to generate revenue for their companies by leveraging existing assets in space is highly relevant at this point,” he said. Orbital ATK has not announced any customers for this new system, but has sold two MEVs to Intelsat, the first of which is scheduled to launch late this year. That MEV will dock with the Intelsat-901 satellite and move it to another orbital slot. The second MEV, planned for launch in early 2020, will dock with another, unnamed Intelsat satellite and take over stationkeeping at its current location. Intelsat had, in 2011, announced an agreement with MacDonald, Dettwiler and Associations (MDA) for servicing its satellites, but dropped the agreement less than a year later after other government and commercial customers failed to sign up for the proposed system. MDA is now part of Maxar Technologies, which also owns SSL. Spengler said he was interested in future servicing capabilities beyond life extension, such as repair. “We are open to doing whatever is best to enable our fleet into the future,” he said.